Jayco is a full service RV manufacturer that builds everything from motor homes to pop up campers. The company was founded in the late 1960s as a family-oriented business, and it has survived the widespread RV industry consolidation. Jayco continues to be family owned and operated to this day, and it is in fact one of the largest family-owned RV manufacturers in the world. 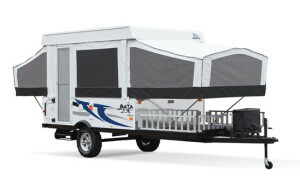 In addition to motor homes, travel trailers, and fifth wheels, Jayco also produces three different lines of pop up campers: the Jay Series, the ultra-light Jay Series Sport, and the a-frame Jay Series Sport Hardwall. Included in the Jay Series is the 1001XR Baja Edition, which is similar to the much smaller and lighter tent-on-trailer units in that it includes a “bike deck” that can support a bike, ATV, or cargo that weighs up to 1,500lbs. Of course, the Baja Edition is a true camping trailer, in addition to a toy hauler, which offers all of the conveniences and comforts that you’d expect from any big pop up camper. Some of Jayco’s camping trailers include cargo decks. Courtesy Jayco RV. Pop Up Campers © 2019. All Rights Reserved.